Assistance League of Klamath Basin, a 501(c)3 nonprofit organization, provides new clothing and other services to families throughout the Klamath Basin. Members are all volunteers (no paid staff) and we fully fund our $150,000 yearly philanthropic programs through donations, fundraisers, estate sales, and grants. The organization began in 1986 and we are part of the national organization, Assistance League, that has been existence for over 100 years. For more information on us see the Overview Slide Show below. 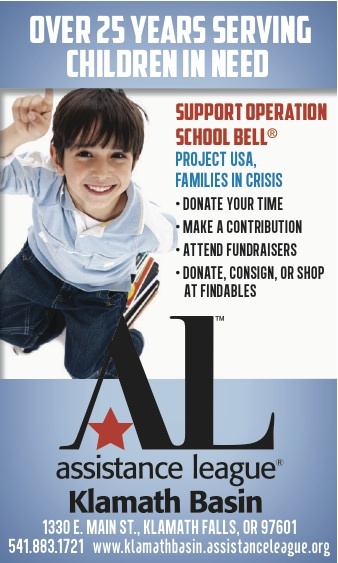 Providing new clothing to more than 800 k-12 grade children in need through our primary philanthropic program, Operation School Bell®. Each child receives a new set of clothes worth $110-125. We spend over $100,000 each school year. Providing Caldecott and Newbery award winning books to 39 schools and 11 libraries. Providing approximately 500 new or gently used books on “Make A Difference Day” (a national sponsored program by the Assistance League) to the SMART reading program for children needing special reading sessions. Supporting Marta’s House, a shelter for domestic abused women and children, with bus tokens, diapers, and wipes, Christmas gifts and holiday treats. Co-sponsoring a children’s show at the Ross Ragland Theater presented twice by a nationally acclaimed touring group to capacity theater attendance of mostly 4th– 6th graders. Providing appropriate graduation clothing to high school seniors in need. Providing an all-day Winter Wonderland event in December, for families to enjoy live music, games, Santa, gift shop, cookies and drinks. These are the types of letters we receive throughout the year from children, and parents.